He completed a Bachelor of Business Studies degree at Massey University and secured a role with Synfuels (now Methanex), where he used an IBM XT machine. He even imported his own computer, a 286, from the US and built up its componentry. More and more, he found friends and acquaintances asking him to build computers for them. “I loved the technology and was an avid member of the shareware club, as I enjoyed trying out new software to see what it could do for me and others that I knew who were using computers. This was a fantastic time to learn on computers, as the world was finding new ways [on a] daily [basis] about how to use a personal computer,” he says. 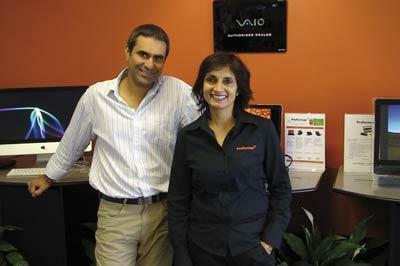 Modgill’s business Proformac Computers was formed in New Plymouth in 1990 and he runs it with his wife Seema. Modgill says being customer focused and meeting the technology needs of buyers are the companies’ objectives. “We aim to firstly find out what the customer wants before recommending anything, and our service extends to making sure the customer is getting the best out of whatever they have purchased from us,” he says. He believes Proformac is the only CompTIA A+ authorised computer service centre in Taranaki. It focuses on the small and home office market, but also serves larger customers. It can also offer computer training. The company offers a wide range of major branded products. “We are (also) an Apple authorised reseller and in the past we have had to rely on Renaissance for Apple. We also use Dove and Ingram Micro a great deal. We do feel that relationships with suppliers is very important and having been in business with a few of them for close to 20 years, it has been a shame to see some of them disappear,” Modgill says. In the past five years, Proformac has added Jaycar electronics products to its mix and created a ‘Plug n Play’ division focusing on electronics. The company has also updated its website recently to showcase the wide range of products it has available, including gift vouchers. “The website is relatively important, however it is not as important as what we can do face-to-face,” he says. While Taranaki is the company’s main service area, it also provides remote desktop support for customers outside this region. The couple loves New Plymouth and say they would never consider moving, because of the long-standing relationships they have built with customers. However, they say it is difficult to attract staff because of the perception there is little life south of the Bombay Hills. “But once here, most become aware of the wonderful city that we have,” Modgill says. Proformac has recently overcome these challenges and employed a new staffer. Modgill says his company wants to make the most of its established customer relationships, saying clients will always seek a company they can trust and understands their needs. “The big thing is integration of devices and the challenge moving forward will always be on how to make the most efficient use of the technology you have,” he says. This is a major aim for Proformac as it moves forward into 2011. “A number of the companies we deal with are still facing a tough time, but hopefully we are not too far from saying the recession is over,” Modgill says.